VAR is just a few days away! Cabins and Adirondacks still available onsite if you want to leave the tent at home, no worries about the weather!!! 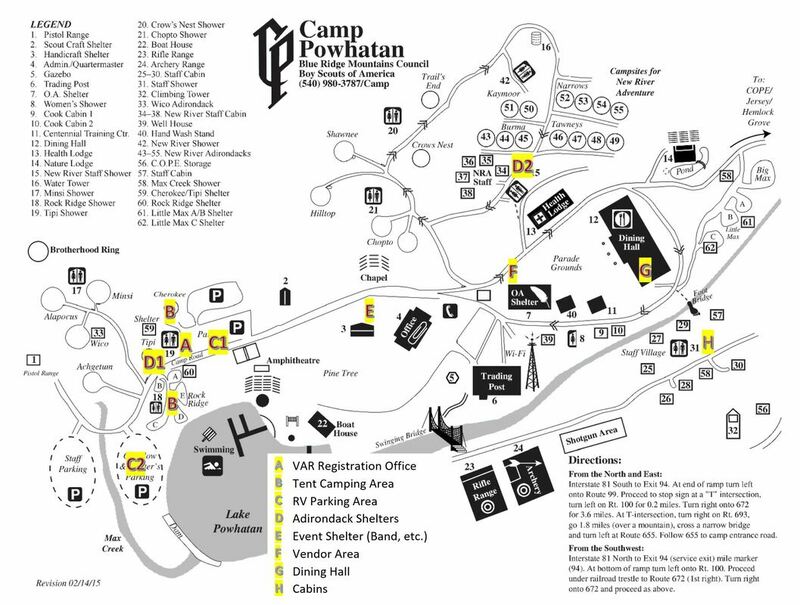 Camp Powhatan is located about 30 minutes SW of Blacksburg, VA, in the mountains just south of Claytor Lake. Most of the facilities at the camp (except the lake*) will be available for our guests, so bring your cave gear, hiking gear, bikes, whatever and enjoy the weekend. This is a beautiful and well equipped venue for a VAR event! There will be plenty of space for camping, and space for RVs too, but no hookups. BYOP! (Bring your own power!) There are lots of modern restroom and shower facilities available for our guests to use. We also get to take advantage of the shelters and cabins at the camp, so if you are worried about the weather or simply don't want to mess with your tent this year, check out the various lodging options! Refer to the CAMPING & CABINS page for further information. Register now and take advantage of the Pre-Registration Discount, details can be found on the REGISTRATION page. We will be fully open for business from Thursday afternoon until Sunday, so come early so you can get an additional day of fun and caving at this year's Spring VAR!!! * The last week of February, a storm damaged the overflow gate valve for the lake, and it had to be drained. Hopefully, the repairs are completed by VAR but they can make no promises. We'll keep you posted! UPDATE: We spoke to the camp ranger, and he said that it doesn't look like the lake will be repaired in time. You can probably count on leaving to canoes and fishing gear at home, unless you plan on going to nearby Claytor Lake! Our original caterer had to cancel due to reasons beyond their control, but have no fear! We have regrouped and have a delicious catered meal in store for you! The menu consists of: Smoked Pork BBQ Sandwiches, Mac & Cheese, Baked Beans OR Green Beans, Cole Slaw, Potato Salad, and Assorted Cookies & Brownies for dessert. We have an optional entrée of Vegetarian Lasagna, which can be accompanied by a choice of sides above, but these will be limited, so please select the Vegetarian Meal option when you register. All meals include a choice of assorted beverages. The dinner is included with registration but only guaranteed for guests that pre-registered before the April 19th cutoff date!!! As an added bonus we will have a complimentary continental breakfast for you!!! (Don't get too excited, it's BYOB, there won't be any bacon!) We'll have coffee, juice and assorted pastries for you to get you going on Sunday morning! ​Nikki Fox will give the Saturday night presentation on the discovery of Sweetwater River, accessed from historical Maxwelton Sink Cave. Since the 1960s cavers have been trying to find the elusive main drain for Davis Spring — a 73-square mile drainage basin in Greenbrier County, W.Va. Many geologists have written papers on it and numerous more have theorized on where exactly this mysterious master trunk stream is flowing underground. In 2016 Nikki Fox found a passage that led to Sweetwater River, part of this massive underground system. Other underground streams have been discovered and over 9 miles have been mapped thus far. You seriously don't want to miss this presentation! We have 13 guided cave trips lined up, including horizontal and vertical trips. In addition there are many caves in the surrounding area that will be accessible to VAR cavers over the weekend to lead their own trips. Check out the CAVE TRIPS page for further details! We are very pleased to announce that Inner Mountain Outfitters will be here! Come up to the vendor area and check out their awesome selection of gear. Helmets, lights, packs and just about anything else a caver needs! This is a Boy Scout camp and the rules are no alcohol !!! Having said that, we will not be inspecting coolers at the gate, but the camp ranger will be coming around keeping the peace. If everyone is discreet and acts like adults, there is no issue. If there is an issue, you will be asked to leave. We hope this is clear. We're sorry, but you'll have to leave the furry ones at home, BSA policy. We have other fun things planned for you throughout VAR Weekend, including a DIY T-Shirt Shop, a vertical workshop, door prizes, Saturday night party, and much more! Check out the EVENT SCHEDULE page for more information! We are feverishly finalizing VAR plans, and are adding to this website as details are available. So please check back occasionally for the latest updates. If there are questions that you can't find the answer to here on the Spring VAR 2019 webpages, feel free to email us at Spring2019VarInfo@gmail.com and somebody from the VAR Planning Team will try to get you an answer as soon as possible.